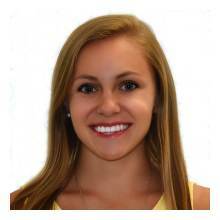 Is your company interesting in supporting PCI's Scholarship Program? Donations of $5,000 or more will be considered a "Named" Scholarship, which means we will name the scholarship distribution after your company. Also, named scholarships enable your company to choose the school to solicit and participate in the selection of the scholarship winner. 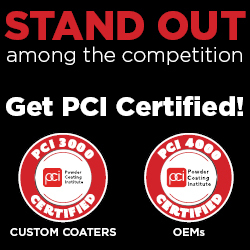 The PCI 2018 Scholarship Program awarded $25,000 to students who are pursuing studies in powder coating technology. 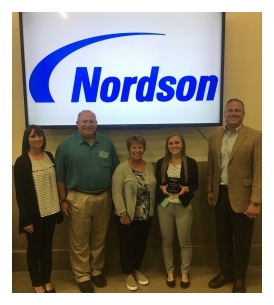 On August 10, 2018, Nordson presented the PCI/Nordson Builds Scholarship to Emily Chojecki. The PCI 2017 Scholarship Program awarded $20,000 to students who are pursuing studies in powder coating technology. The PCI/Gema 2017 Scholarship was awarded at Powder Coating 2017 in Indianapolis, IN. PCI Executive Director, Trena Benson along with Scholarship Chair Kevin Biller and Gema representative, Chris Merritt, present Gabriella Bettegnies (IUPUI) and Luke Groninger (Purdue Polytechnic) the 2017 PCI/Gema Scholarships. Axalta Business Director Michael Bollen (left) presents scholarship to recipient Ted Hammer at the Axalta facility in Hilliard, Ohio. Benjamin Whipker receives his award during a ceremony at the Nordson Amherst campus. (Left to right) Dan Thompson, director of sales, Nordson Corporation; award recipient Benjamin Whipker; Greg Dawson, regional sales manager, Nordson Powder Coating Systems; and Sue Ivancic, account executive, Nordson Powder Coating Systems. (Left to right) PCI General Scholarship award recipients Raviteja Kommineni, Eastern Michigan University and Shiyin Yu, Eastern Michigan University.